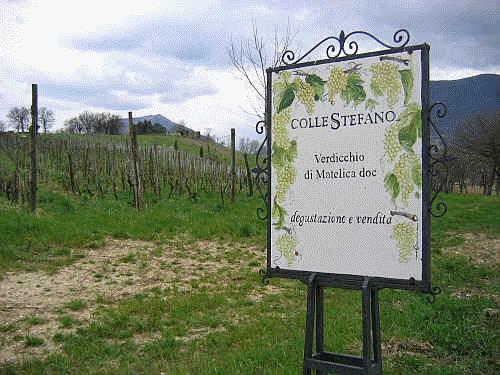 Collestefano was started in 1998 when Fabio Marchionni took over the estate that had been in his family for years. After getting his degree in agriculture, where he did his thesis on Verdicchio di Matelica, he went to Germany to work for Weingut Zähringer where he learned to work and farm organically with minimal impact to the environment. He then worked briefly in wine bars and restaurants before taking over the family farm. His Verdicchio has been consistent in quality, winning at least two glasses from Gambero Rosso since the 2001 vintage (twice winning three glasses). It is a great value for a Certified Organic wine. This wine easily competes with any Verdicchio on the market, most of which are more expensive. The Matelica zone is further inland and at a higher elevation than the more common Verdicchio di Castelli di Jesi. Matelica wines tend to be brighter and more elegant whereas the Castelli di Jesi wines often have a little more fruit and heft. Collestefano is textbook for the Matelica style – bright and crisp with floral notes and a hint of pine.